Bernadetta Skwarczyńska could best be described as a spiritual painter, insightful, profound and powerful her work often takes inspiration from the natural world as well as an energetic spiritual world of her imagining. Starting her career as a landscape and portrait artist, Bernadetta eventually developed a very colourful, vibrant and dynamic style for which she is now globally recognized. Although Bernadetta has been painting in oil on canvas for over 20 years, she is still finding new, exciting ways to work with colour. Her subjects range from far away celestial galaxies, to mythical creatures and human souls. Bernadetta is also very much inspired by the human body, specifically the male form, always working with live models, she endeavors to look past the obvious, concentrating on the energies around the person and is striving to reflect the mind, soul and essence of the subject. As well as looking at the human body as an organic outer form Bernadetta has an avid fascination with the unseen microcosm of an internal cell in the human body, allowing her to transcend the human body. The artist comments; “Whether the painting is of a human being or a galaxy this is all the same energy, all the same matter, and often we forget this!” Bernadetta was born in Poland, where she worked as a Fashion Designer for Viva Poland, worked in collaboration with Designer Piotr Ciepa and also as worked for many years a Catwalk Model. Her main career though was in journalism, already having experience and a keen interest in painting and working as a Graphic Designer, it was a natural step for her to develop into a career specializing in art journalism. Whilst still living and working in Poland Bernadetta hosted two major, critically acclaimed exhibitions of her works gaining both notoriety and exposure. She later started to develop an interest in the positive effects that arts and more specifically art therapy could have on the human mind, thus she started to work in the psychiatric ward of a hospital. Bernadetta helped patients to communicate and articulate their feelings in various artistic outcomes to overcome mental illness, a cause that is still very dear to her heart! Bernadetta explains “The Occupational art therapy that I lead, let me look at the human mind free from restrictions. It was a fascinating experience. This experience has taught me that only the unfettered mind is able to show the true emotions.” Bernadetta now lives in picturesque Bournemouth on England’s South coast and is working under the pseudonym Seven’ Art. In 2012 the work of Seven’Art was showcased in a two month exhibition in Bournemouth. 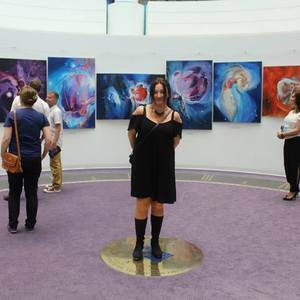 Bernadetta has undertaken numerous exhibitions in Bournemouth as well as London and hopes to open a gallery and studio space where she can create and display her work as well as nurture the talents of rising artists and continue her work in arts therapy for the benefit of the community. Exhibitions 2013 : The Misty Moon Gallery" - London, "Plush Corner" - Poole, "Bournemouth International Center" - Bournemouth, "Pop Up Gallery" - Boscombe, "Ward 9 Gallery" - Bournemouth. Bernadetta sells her work in both original form and as limited edition prints online to a global audience and will consider all requests for commissions. “I myself studied in the arts for over 10 years, and have attended innumerable art shows after a while everything tends to look the same. I have however never seen work like Bernadetta’s! Her work has a unique and powerful energy that has to be seen to be felt. To talk to her about her work is to glimpse a rare talent and passion fueled by a fiercely intelligent mind.” - Paul Scadding, Ambassador for Enterprise Bournemouth and Poole College.